I recently visited the Fort Ancient State Memorial where in 1992 I excavated the “most interesting thing I have ever found” in my archaeological field work. I remember the event well because the discovery caused me to truthfully answer the questions every field archaeologist has been asked hundreds of times “Finding anything?” and the related “What is the most interesting thing you have ever found?” On that day 20 years ago, I got asked both questions. Here is the story – the incident occurred in the summer of 1992 at the end of a hot and humid August day. I was tired, the mosquitoes were vicious in the ponding area I chose for excavations. 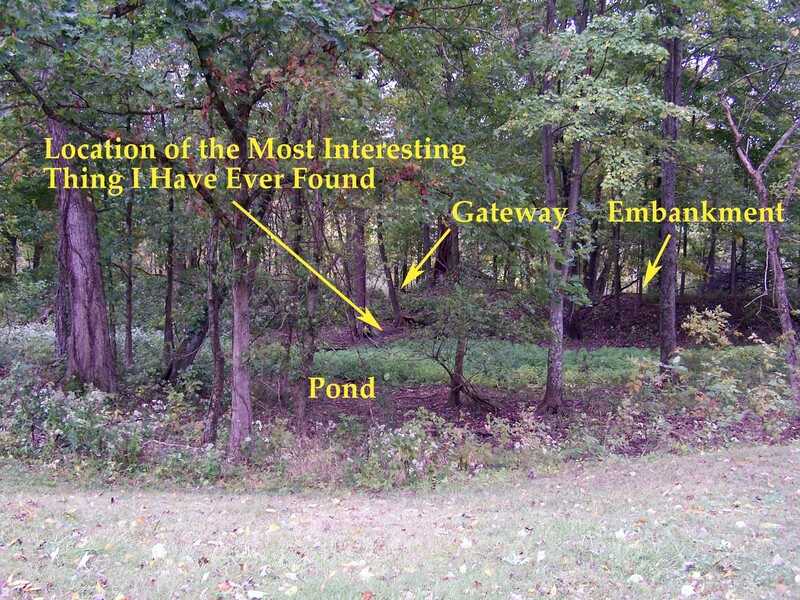 My dissertation research involved documenting the pond and ditch system configuration along the 3.5 miles of prehistoric embankment walls constructed by prehistoric Native Americans some 2000 years before. Data from soil cores demonstrated that the original constructed form of the interior ditch did drain into the connected ponding area. But I was puzzled by some odd stratigraphy from an excavation unit placed at the base of a gateway opening in an adjacent embankment wall. In the unit, I was excavating considerably deeper than the adjacent pond base and still not reaching culturally sterile subsoil. I was going through various contortions of logic to explain the cultural materials found at the deeper levels. But then, I came down on a hearth, one meter below the level I should have encountered culturally undisturbed soils. Burrowing rodents or other “natural formation processes” could not drop an intact hearth one meter below the anticipated base of cultural occupation. I got out my trusty JVC soil probe, a manual contraption capable of extracting intact soil samples to a depth of 5m below ground surface. I worked till dusk extracting soil cores from areas of the pond not previously surveyed. I determined that the a considerable part of the landscape was filled and sculpted by the prehistoric engineers to create the ponding area. Specifically Native Americans in prehistory filled in a five meter wide erosional ravine beneath the current pond base. This conclusion was counter to the prevailing wisdom that the prehistoric engineers simply followed the preexisting contour of the natural landscape in their construction plans. Over the next few years testing at other areas of the site showed similar modifications, ultimately suggesting that the above ground mounds and embankment walls at Fort Ancient represent perhaps only 2/3 of the total soil that was moved in building the earthwork complex. So on the late August afternoon in 1992 when an elderly couple came up and asked “Finding anything?” I pulled some flint tools from the artifact bag laying in the screen to show. To the follow-up “What’s the most interesting thing you have ever found?” I decided not to talk about the row of six bladelets laid side by side next to pit feature, or the three-layered limestone pavements outside the earthwork complex – instead, I told about the landscape modification I had just stumbled upon. It wasn’t glamorous, it didn’t shine or sparkle, but to me it was a marvel of prehistoric engineering. Standing on the edge of the pond and swatting at mosquitoes as dusk turned to night, the couple was as amazed and interested as me. I learned a big lesson that day in archaeology. We sometimes think that digital supersedes the tactile, that Indiana Jones trumps the mundane, that false certainty is better than asking the visitor “what do you think?” This last point is particularly relevant. I discussed this before with headless Poverty Point figurines. I believe that it is our task as archaeologists and museum professionals to make these issues relevant to the public who pay our salaries. Often times that can be as simple as taking the time to tell the truth about our research and not assume that the public only wants to hear about what sparkles and shines. By the way, today, in 2011, when asked about the most interesting thing I have ever found, I talk about a slate button I once held from the appropriately named Slate site near Yazoo City Mississippi. The button had a blind hole drilled from the back for attachment. I remain completely impressed that nearly 4000 years ago, folks in Mississippi used buttons in the same way that we do today! What’s the most interesting thing you have ever found? ← Are Museum Ethics Changing?